Hello, I am wondering what curve I need to upload to my Therion 166 so I can use my 26G SS316L fused clapton WITHOUT TC normal working, but with pre-heat punch. So mod will fire full wattage, thinking temperature is low. 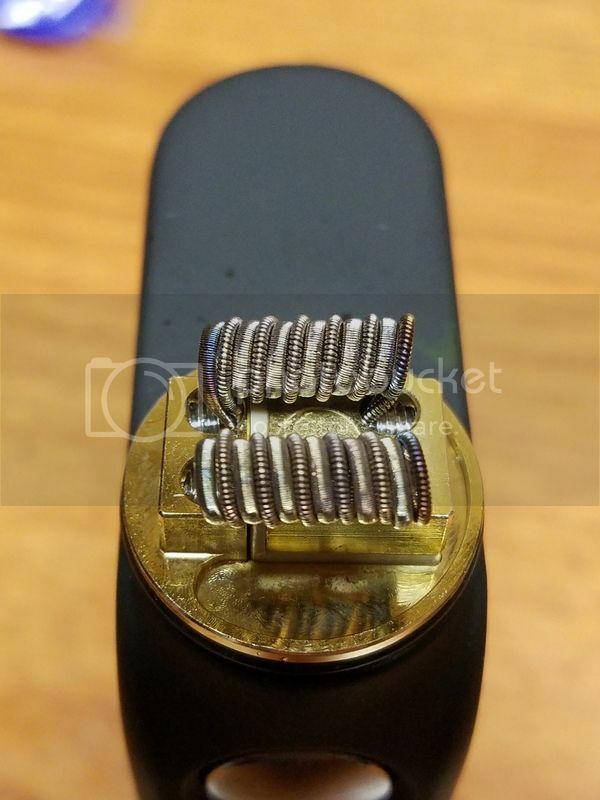 I have found fake 'tc' profile for kanthal, for preheat to work with kanthal, so I wonder is it possible to do same with 316L? Ive tried with kanthal profile from Steam Engine, this gets Temp Protect instantly at button press. Ive tried with Nikel profile, this one silently switches to Power Mode (why?). Mostly I use TC for this dripper, but some time TC mode not so satisfying like every-hit-warmer wattage vape. Normally I would switch to Power mode, but the coil is massive, and for this rare situation I would like to have this pre-heat profile in my mod. I have done this, and after two puffs mod goes into strange mode, showing screen like I am in power mode (volts, amperes) but I can still adjust temperature (its not OFF) and watts like I am in temperature mode. What is this mode and how to avoid this? Also tried overriding ohms with slightly lower value than I have, and locking, after some puffs mod re-reads the resistance and updates it to my real value (like in wattage mode), still showing lock symbol. Feels like mod knows that current material curve does not match real coil material. The kanthal trick works because the resistance doesn't change, simply the board goes preheat>not TC>powermode. I can see what you are hoping to achieve but I would guess that you need to set preheat to reach your desired max then adjust running power to a level that does not allow TC to operate whilst still heating up the coil. Then when you would have to set it up by the live result of mod monitor? It can't be that big a coil not to work in power mode without preheating it. I use a 26g 3 core parallel fused juggernaut claptrap in an aeronaut. But I still wouldn't want to flash 150w through one even for half a second. I know exactly why you want to hit a ridiculous coil hard to cut ramp up. What I don't understand is why you want it to keep going like a mech. Are you trying to replicate the vaping feel of an unregulated device with the benefit of pre-fire? Could you not just set your temp control up as properly as you can, then turn the temperature up as high as you can stand? Then regulate the vaping experience with your finger? A quicker drag shouldn't hit full temp if it's set high enough. Repeated pulls will slowly escalate in temp up to where you cannot stand it. I fire things that are at the limit of what full (18650) batteries and the DNA can stand in TC mode every day. My cosmonaut has two different styles of 316L clapton wire alternating on each coil. (triple fused parallel, and some 26G traditional) It is not spaced, and I hit it with 120W to lift it up. My fall down wattage is 85W, and it frequently sits around 45-50W during repeated pulls once it's warm. I frequently hit the battery warning on an ice cold startup with even slightly depleted batteries from sag. I don't know what you're firing, but those coils clock in around .08XX. You maybe get 3-5 pulls and it needs a full dropper to be juiced again. If you want to plow through a 60ml bottle in a few days, they are IDEAL. Without temp control those would probably physically injure me around the 4 second mark, even with side and top airflow on that atomizer wide open. Is it possible that your device is not set up correctly, which is not allowing you to reach the temp / vape you want? The entire point of the DNA/regulated device (to me) is that I can do utterly stupid sh... stuff and not actually hurt myself. Why circumvent that when I think it will deliver what you want, and also stop when you reach what you can handle? This is just to replicate wattage mode vape. No, I am very satisfied with TC vape, my ss316 profile might be slightly off, but I adjust temp to taste. All this is just for experiment. The one thing that I want to know exactly - does DNA automatically guess that temp curve don't match, and why it switched to wattage mode on wrong curve. Just to know working algorithm. How this works? DNAs will not be like a mech with SS, because they do proper power regulation and not just set the voltage from reading the watts once. They will not have the slight reduction of power fixed voltage devices have with a wire that increases resistance with temp.